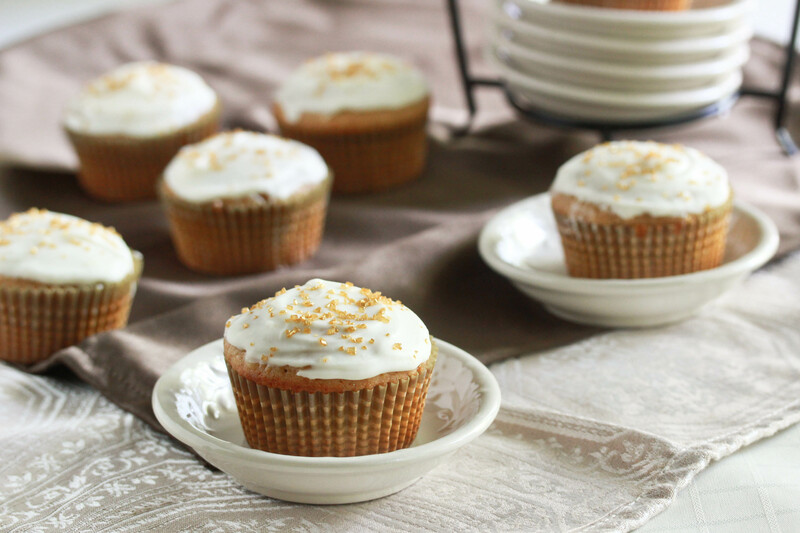 I think this post was supposed to have an introduction about how Rosh Hashanah is coming, and how you might want to make these delicious cupcakes instead of the traditional honey cake. But I got home from work at 9 pm tonight, then spent the last couple of hours filling an order for cake pops. (Didn’t know I sell stuff? Well I do. Email me.) It’s after 1 am, and I shouldn’t be posting anything. But I want to share this recipe with you folks so anyone planning their Rosh Hashanah desserts can include these gorgeous little treats in their menu. So excuse me if I am being brief. Oh, also, if you aren’t Jewish, don’t let that stop you from making these. Honey is a lovely flavor and should totally be used more often in baking. Preheat oven to 350. Line a cupcake pan with paper liners and set aside. In a small bowl, whisk together the flour, baking powder, salt and cinnamon. Set aside. In the bowl of an electric mixer, cream together the butter/margarine and brown sugar until smooth. Add the eggs and vanilla extract and lemon zest and beat until smooth. Beat in the honey. With the mixer on a low speed, slowly stir in the flour mixture until combined. Add the milk and stir until incorporated. Divide the batter evenly among the 12 cupcake liners. Bake at 350 for 15-16 minutes. Do not over-bake. Beat all ingredients together until smooth. Spoon on top of cooled cupcakes, and top, if desired, with gold sanding sugar. I love honey and these little honey cakes look like perfection! The cupcakes look wonderful. I’m a big fan of honey. I hope at some point in the future you have time to post those cake pops you made for the order. How does tofutti cream cheese in the frosting compare to real cream cheese? I only made it with tofutti and it was amazing. Yay. Thanks. Can’t wait to try it. Will however use tofu cream cheese to make it pareve. You’re the BEST.! Oh my!!! Those look soooo good! Printed this recipe– they look so good, and remind me of fall! Can I make the cupcake and freeze it and frost it right before the Holidays? As long as you freeze these un-frosted it should be fine. I am in love with this recipe! And the pics are stunning. Nicely done! 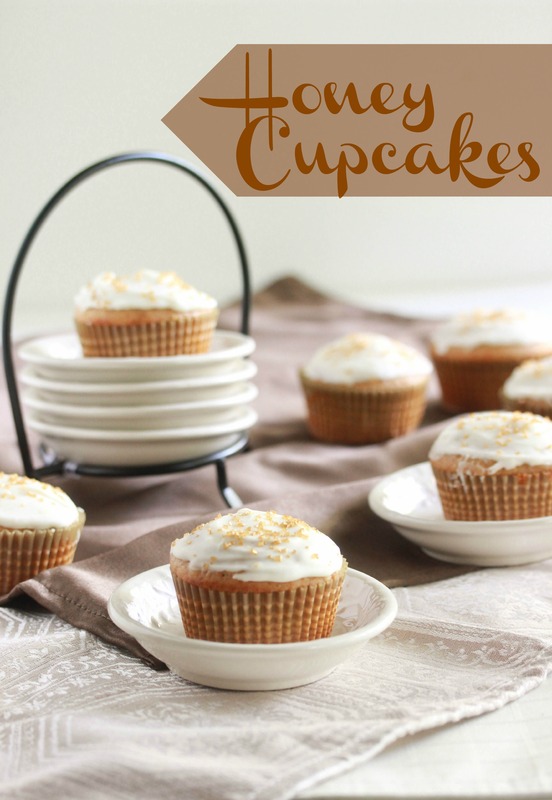 I plan on making these cupcakes some time during the holidays. I’m not Jewish but they still look like a must try for me! Delicious. 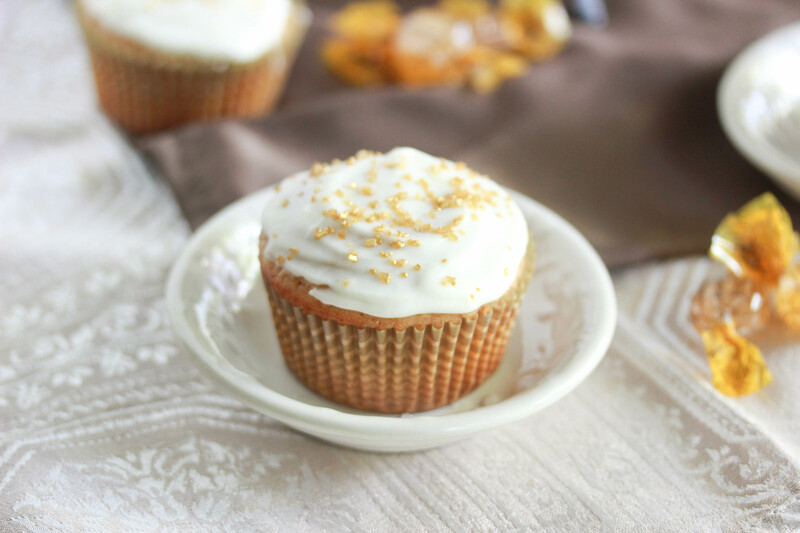 honey & gold sugar sprinkles – heaven! My kids are not big honey cake fans, so when I saw this, I thought it was a great idea to make them as cupcakes with a frosting. I baked them yesterday and planned on freezing them and frosting later, but I almost had none left to freeze. They are delicious! Much lighter than the honey cakes I’m used to. Was looking for something different than the usual white, yellow, or chocolate cake that would go over well with a crowd of people and came across this recipe. We just made a double batch for Mother’s Day and of course had to do a taste test. OMG soooooo good. My husband, who hates cake & cupcakes loved it and is now upset that he can’t have any more. Fantastic recipe thank you so much. We are going to be adding a lavender cream cheese frosting and decorating with lilacs. Can’t wait for all the Mother’s to see & taste them. If it will be more than a couple of days I would freeze them. Can these cupcakes be frozen with the frosting? Once they’re frosted you should. Can I substitute water or orange juice instead of the milk? Can I sub oil for Marc/butter? Can I omit the lemon zest? Will they still be good? It will be fine, but not the same. There’s no replacement for lemon zest. Need suggestion what can i do if i put lot of honey in froasting? since i cannot use it on cake can i bake a cream cheese cake from it?